President Donald Trump meets with Canadian Prime Minister Justin Trudeau during the G7 summit on Friday. 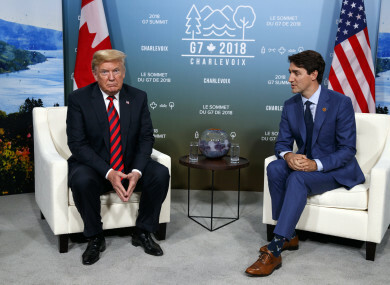 THE US BLAMED Canada for the disastrous ending to the G7 summit, saying Prime Minister Justin Trudeau “stabbed us in the back,” while American allies held Washington responsible. Just minutes after a joint G7 communique was published Saturday in summit host city Quebec, President Donald Trump launched a Twitter broadside, taking exception to comments made by Trudeau at a news conference and saying he had instructed US representatives not to endorse the joint communique. Trump’s team kept up the barrage of criticism on US media yesterday. Trudeau “really kinda stabbed us in the back,” top US economic advisor Larry Kudlow said on CNN’s “State of the Union”. US trade advisor Peter Navarro, speaking on Fox News Sunday, reinforced that message. “There’s a special place in hell for any foreign leader that engages in bad-faith diplomacy with President Donald J Trump and then tries to stab him in the back on the way out the door,” he said. Kudlow sought to tie Trump’s reaction to the upcoming summit with Kim Jong Un, saying the North Korean leader “must not see American weakness”. Trump – who has a history of hair-trigger responses to slights – landed in Singapore yesterday for tomorrow’s summit meeting with Kim. From there, he was tweeted further criticism of Canada and US allies. “Why should I, as President of the United States, allow countries to continue to make Massive Trade Surpluses, as they have for decades, while our Farmers, Workers & Taxpayers have such a big and unfair price to pay?” he tweeted. Based on Justin’s false statements at his news conference, and the fact that Canada is charging massive Tariffs to our US farmers, workers and companies, I have instructed our US Reps not to endorse the Communique as we look at Tariffs on automobiles flooding the US Market! German Chancellor Angela Merkel late yesterday called Trump’s revocation of support for the G7 joint communique “sobering and a little depressing”, while adding, in a rare one-on-one interview with ARD public television, “but that’s not the end” of the Group of Seven. Trump in his tweet said Trudeau had “acted so meek and mild during our @G7 meetings only to give a news conference after I left saying that… he ‘will not be pushed around.’ Very dishonest & weak”. Trudeau had told reporters that Trump’s decision to invoke national security to justify US tariffs on steel and aluminum imports was “kind of insulting” to Canadian veterans who had stood by their US allies in conflicts dating back to World War I.
Trudeau said he had told Trump “it would be with regret but it would be with absolute clarity and firmness that we move forward with retaliatory measures on 1 July, applying equivalent tariffs to the ones that the Americans have unjustly applied to us”. Canada’s Foreign Minister Chrystia Freeland added that “Canada does not conduct its diplomacy through ad hominem attacks, we don’t think that it’s a useful or productive way to do business and perhaps we refrain particularly from ad hominem attacks when it comes to our relationship with our allies”. “That’s what matters,” he wrote. The outburst against Trudeau, and by association the other G7 members, is only the latest incident in which Trump has clashed with America’s closest allies, even as he has had warm words for autocrats like Kim and Russia’s Vladimir Putin. French President Emmanuel Macron’s office reacted Sunday by saying that “international cooperation cannot be dictated by fits of anger and throwaway remarks”. Reneging on the commitments agreed in the communique showed “incoherence and inconsistency”, it said in a statement. When Trump left Quebec, it was thought that a compromise had been reached, despite the tension and the determination of European leaders Macron and Merkel to push back against the US president’s protectionist policies. On board Air Force One, an AFP reporter was told that Trump had approved the agreement, only to be told later of the tweets. A senior US administration official said that Trump had been angered by Trudeau’s comments. Trump is set to meet North Korea’s Kim Jong Un tomorrow in Singapore in a historic summit between the US and North Korea. Email “Trump continues Twitter attack on US allies following G7 summit: 'Justin acts hurt when called out!'”. Feedback on “Trump continues Twitter attack on US allies following G7 summit: 'Justin acts hurt when called out! '”.